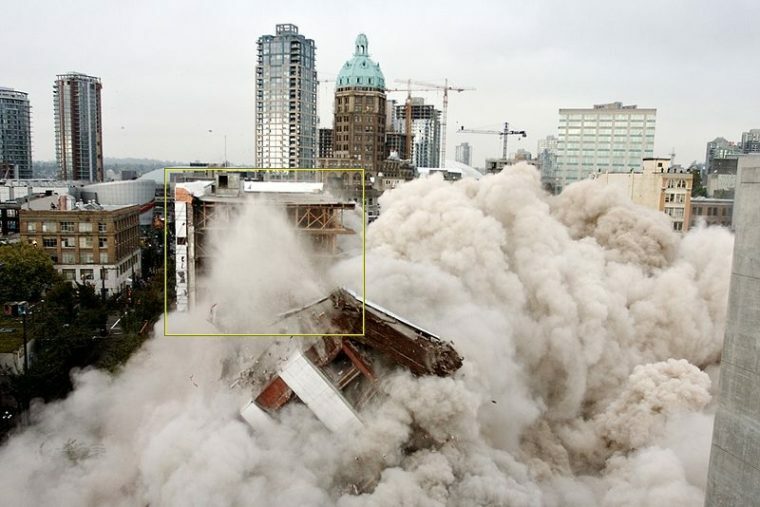 “Woodwards building Vancouver demolition 2,” Tannoy, GNU Free Documentation License. W.W.A.S. is a provisional research collective assembled by 221A to study the historic transformations of Vancouver’s storied Woodward’s building. 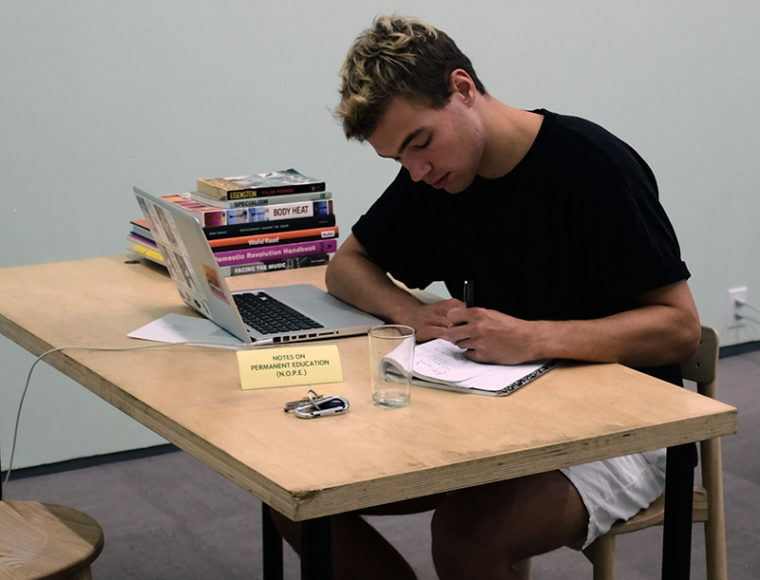 Since September 2017, the collective (Brit Bachmann, Gabi Dao, Josh Gabert-Doyon, and Byron Peters) has occupied Pollyanna 圖書館 Library to plan and carry out an investigation into Woodward’s as an epicentre of local class struggle. W.W.A.S. 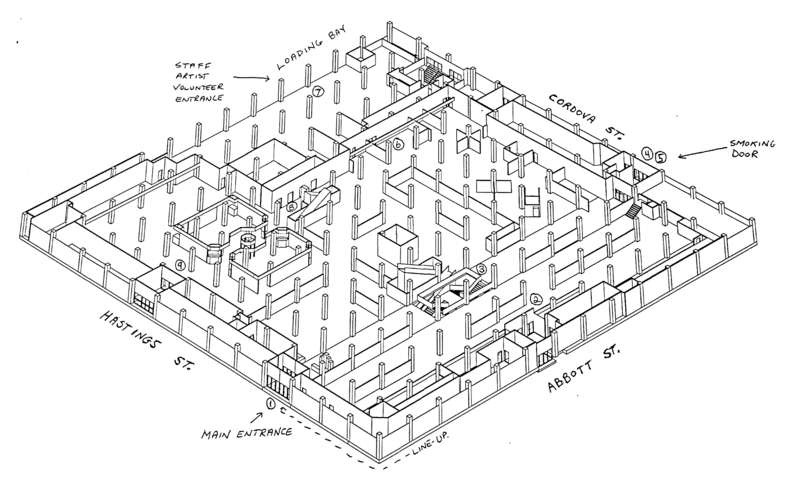 has charted the building’s various articulations over the past century in order to grasp Woodward’s as a historical constellation; that is, as a tangle of intertwined narratives through which to comprehend the distinct co-development of urbanism and capitalism in Vancouver. Beginning with accounts of the building’s origins in 1903 as a ‘frontier’ department store, the collective’s research has traced the history of Woodward’s—not simply as an architectural case study, but as a contradictory cluster of actants, desires, and ideologies—by drawing connections between fragments of civic archives, activist histories, commercial ephemera, redacted emails, quaint Canadiana, and nostalgic Facebook groups. W.W.A.S. understands this ‘prehistory’ as a force that haunts Woodward’s controversial ‘present history’ of the last two decades: its acquisition, demolition, and reconstruction as a ‘social-mix’ condo-art megaplex by Westbank Corp, a model now archetypal of private-public redevelopment schemes. Artropolis ’93 Floorplan, Unknown, Audain Gallery Archives. The nature of the collective’s findings—uncovering an ulterior history of Woodward’s—has led its activity out of the Pollyanna Library stacks and into unfamiliar territories in purpose and method. In coming to the understanding of present-day Woodward’s as an engine of ‘art washing’, wherein the ongoing, brutal redevelopment of Vancouver’s ‘urban frontier’ is sold as a form of cultural production (a logic that has reached its apotheosis in Westbank Corp’s insipid Fight for Beauty rebranding spectacle), the collective was moved to refocus its energies towards not only understanding the politics of Woodward’s, but intervening in it. In short; what arose was an ethics of research. Consequently, W.W.A.S. has taken on a program of ‘action-research’, where knowledge production meets the political through tactics of insurgent publishing, journalistic provocation, and building living solidarities. On November 26 2017 W.W.A.S presented a midterm report of its research and activities at the Vancouver Tenants Union’s First Annual Convention. On February 2018, W.W.A.S. hosted and moderated BITE THE HAND THAT FEEDS: FORUM ON ART AND DEVELOPER MONEY at Pollyanna 圖書館 Library. The forum invited artists to participate community dialogue on artwashing — the co-option of art workers and institutions by real estate in Vancouver. BITE THE HAND THAT FEEDS… opened a space for artists who are either new to or already committed to fighting for housing justice to ask questions, share experiences, and strategize together to win a better collective life for all. W.W.A.S. is assembled by Notes on Permanent Education (N.O.P.E. 2017), a collective research program convened by 221A Librarian Vincent Tao. N.O.P.E. 2017 inaugurates the organization’s new fellowship model and its primary support, Pollyanna Library.